With Passover and Easter upon us, what a perfect opportunity to prepare a new dessert for our family and friends. If you are familiar with my Apple pie you will love this new recipe. Roll out the pie crust in a 9-inch pie dish. Make sure the crust is all the way up to the rim. Poke lightly the dough and place in the hot oven for 5 to 7 minutes. Remove and let it cool off. In a large bowl whisk together the eggs, heavy cream, vanilla extract and the brown sugar. 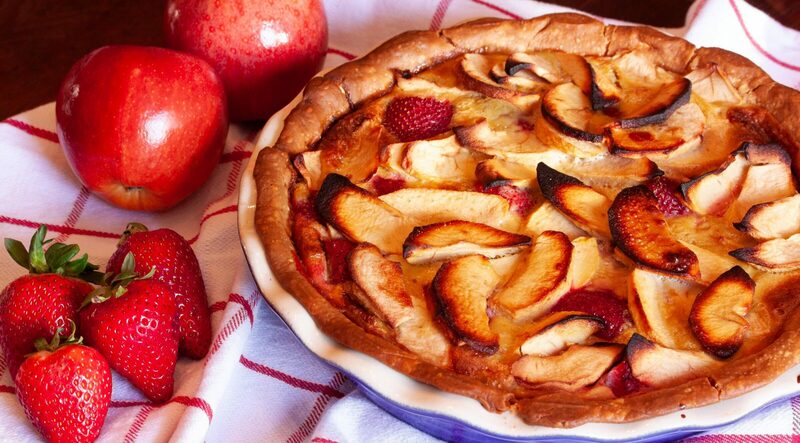 Add the sliced apples and strawberries to the pie dish. Cover with the egg mixture. Place a pie shell shield to cover the border of the dough or make one with aluminum foil. Lower the heat to 375°. Bake the cake for 40 to 50 minutes. The top should be nice a golden brown, and the middle should not be runny. Love the flavours ..apples and strawberries.. perfect for any special occasions with loved ones!! Hi Swati, Absolutely!! The flavors are wonderful and perfect also for summer or anytime pot-luck, celebrations or just ’cause. Thank you for reading my blog and have a fantastic day.